The questions raised in “Serving on the Home Front,” came when I was browsing draft registration cards. I browsed the draft cards looking for my Great Grandfather, Bryant Edward Hays. I had started thinking about him while I was reading a novel about a family that lived through the two world wars. Born in 1888 and married in 1916, I wondered whether he served. I look forward to exploring the ways in which people served on the home front in WWI. 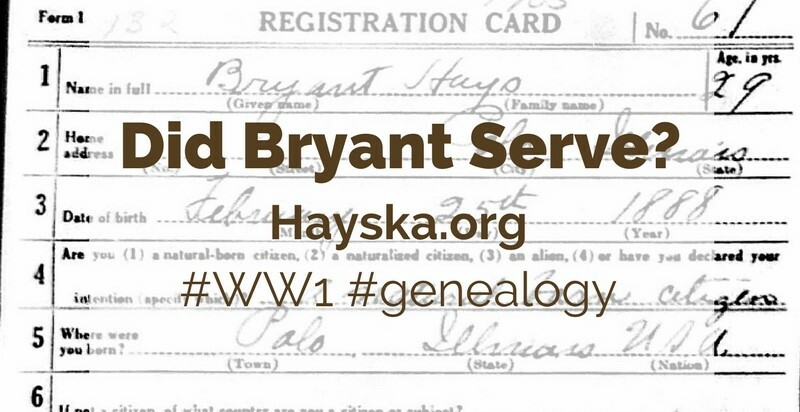 (1) “World War I Draft Registration Cards, 1917-1918,” digital images, Ancestry.com (http://www.ancestry.com : accessed 2 Apr 2017) Card for Bryant Hays. Citing “World War I Selective Service System Draft Registration Cards, 1917-1918,” Washington, D.C.: NARA, M1509, Roll: 1614436. (3) “U.S. World War II Draft Registration Cards, 1942, ” digital images, Ancestry.com (http://www.ancestry.com : 2 Apr 2017) Entry for Bryant Hays. Citing United States, Selective Service System. Selective Service Registration Cards, World War II: Fourth Registration. NARA Branch l, NAI Number: 623284; Record Group Number: 147. (4) 1930 U.S. census, Ogle County, Illinois, population schedule, Buffalo Township, enumeration district (ED) 3, Sheet 1A (penned), Page 268 (stamped), dwelling 12, family 12, Bryant E Hays household; index and digital images, FamilySearch (http://www.familysearch.org : accessed 7 Jun 2017), citing NARA microfilm publication T626, roll 546. Posted on 26 July 2017 Categories Research, WW1Tags Hayes/Hays, Illinois, WW1Leave a comment on Did Bryant Serve? Recently, when I was browsing through WW1 draft registration cards, I started thinking about the individuals who didn’t serve. What was the role of the citizens who stayed home? How did they serve their country? What were the different roles in the community? 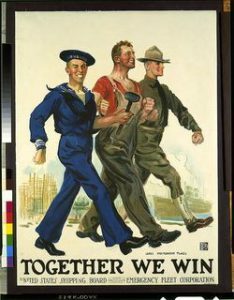 As examples, I’ve started pinning posters for farming, victory gardens, and rationing. Besides the roles people fulfilled, I’m also curious of the psychological impact on those that stayed home. Was there guilt, anger, shame, or pride? I would be interested in talking to anyone else who has these same questions. Header Image: “An opportunity to show patriotism, 13 Jul 1917” Newspapers.com (http://newspapers.com : 13 Jul 2017), clipped by “jlbartimus.” Originally appeared in The Daily Chronicle (De Kalb, Illinois), 13 Jul 1917, Page 3. I went searching for the original census cards and found the images at FamilySearch. My great grandmother would have been age 16 in 1905 and was born in Tennessee. This is an indication that the 1905 Census Bessie is not the same person. I then looked for Bessie and Veta in the 1900 federal census, but didn’t find any perfect matches. The closest matches are in the West Greenwell and Martha Greenwell households. 1887: School for Colored Children opens in Chicago, Kentucky. 1890: Sisters leave Kentucky on Nov. 30. Francis Academy opens in Mason City, Iowa. This is enough for me to take the 1905 Census out of my great grandmother’s history, but not enough to connect the 1905 Iowa Census Bessie and Veta with a 1900 Census households. So, I’m still trying to find where Bessie was in 1910 and what brought a girl from Tennessee together with the boy from Illinois for a wedding in Iowa. (2) “Iowa State Census, 1905,” digital images, FamilySearch.com (http://www.familysearch.com : accessed 31 Mar 2017) Entries for Bessie Greenwell, Card #622, and Veta Greenwell, Card #623, St. Fancis Convent. (3) 1900 U.S. census, Marion County, Kentucky, population schedule, Chicago, enumeration district (ED) 80, Sheet. 4-A (penned), line 38-44, dwelling #63, family #64, West Greenwell household; digital images, Ancestry.com (http://www.ancestry.com : accessed 31 Mar 2017); citing National Archives microfilm publication T623, roll 542. (4) 1900 U.S. census, Breckinridge County, Kentucky, population schedule, Union Star, enumeration district (ED) 7, Sheet. 10-B (penned), line 38-44, dwelling #182 (corrected), family #183 (corrected), Martha Greenwell household; digital images, Ancestry.com (http://www.ancestry.com : accessed 31 Mar 2017); citing National Archives microfilm publication T623, roll 510. (5) “The Sisters of St. Francis: Missions and Milestones,” 2 May 2016, Transcription, Clinton Herald, Clinton, Iowa (http://www.clintonherald.com : 31 Mar 2017). 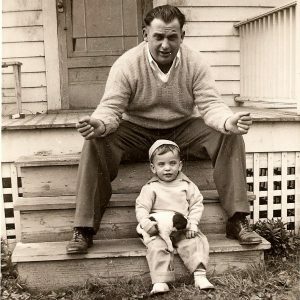 I believe they were married before 19920, because in 1910, Bryant is with his father (2). However, Bessie is not in her father’s household (3). 1910 Census: Martin Greenwell (head, 58), Rebecca L Greenwell (wife, 58), Tim Greenwell (son, 28), William E Greenwell (son, 23), Robert T Greenwell (son, 19), and Clay Greenwell (son, 15). In addition, there are no other Greenwell’s in Civil District 2, Washington County, Tennessee. So, where is Bessie in 1910? Is she living with a sibling, aunt, or uncle? The 1910 census indicates that Bessie’s mother, Rebecca Greenwell, has 10 living children, only four of whom live with them. Is Bessie living with a relative of Bryant? Does a Bessie P Greenwell exist elsewhere is the 1910 census or in a state census between 1900 and 1920? I didn’t find Bessie with any known Greenwell siblings, aunts, or uncles nor any known Hays siblings, aunts, or uncles. I have not found any other information about Veta, so I don’t yet know whether there is any relationship the two Greenwell girls. There is also no additional information in the 1905 digital image, except a reference to Card #622. Most likely the digital images are an index of 1905 census cards that had details of each individual. I did not find the Convent in the 1910 census for Mason City, Iowa. In trying to find where Bessie and Bryant came together, I found their marriage information (5) for 3 Jun 1916 in Clinton, Iowa. Their parents are included in the database, increasing my confidence in snatching up the right marriage record. But, what took them both to Iowa and where is Bessie in 1910? The only relation in Iowa is Bryant’s great aunt who is living in Lafayette, around 83 miles from Mason City. But, Bessie is not in her household in 1910. Find the cards for the 1905 Iowa State Census and see whether they offer more details about Bessie and Veta. Find any archives or manuscripts for the Convent on E Drummond in Mason City. Review newspapers in Mason City, Iowa, Washington County, Tennessee, and Ogle County, Illinois that mention the convent or Bessie. 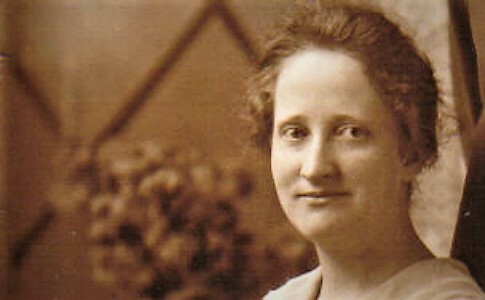 Discover more about Veta Greenwell to see how or if Bessie and Veta are related. (1) 1920 U.S. census, Ogle County, Illinois, population schedule, Pine Creek Township, enumeration district (ED) 104, Sheet. 7A-B (penned), line 50-52, dwelling #157, family #157, Bryant Hayes household; digital images, Ancestry.com (http://www.ancestry.com : accessed 30 Mar 2017); citing National Archives microfilm publication T625, roll 398. (2) 1910 U.S. census, Ogle County, Illinois, population schedule, Buffalo Township, enumeration district (ED) 65, Sheet. 3A (penned), line 31-37, dwelling #53, family #53, Charles W Hays household; digital images, Ancestry.com (http://www.ancestry.com : accessed 30 Mar 2017); citing National Archives microfilm publication T624, roll 314. (3) 1910 U.S. census, Washington County, Tennessee, population schedule, Civil District 2, enumeration district (ED) 190, Sheet. 7A (penned), line 1-6, dwelling #107, family #107, Martin Greenwell household; digital images, Ancestry.com (http://www.ancestry.com : accessed 30 Mar 2017); citing National Archives microfilm publication T624, roll 1524. (5) “Iowa, Select Marriages Index,” database, Ancestry.com (http://www.ancestry.com : accessed 30 Mar 2017) Entry for Bryant Hays and Bessie Greenwell, 4 Jun 1916. Citing FHL Film #1840000. Posted on 30 March 2017 31 December 2017 Categories Kinship, ResearchTags Census, Greenwell, Hayes/Hays, Illinois, Iowa, Research, TennesseeLeave a comment on Where’s Bessie?